It's Chrisssssssstmas season! And officially time for our first Christmas post here at Ruby. Now while we aren't fans of all the kitsch tinsel and plastic Santa's that Christmas time brings, it's hard not to get sucked in to a little merry Christmas cheer at this time of year! It's a lovely time of year, and who doesn't like receiving gifts? Christmas shopping can make or break us, with everyone and their dog meandering the shopping malls, with no one entirely sure what to buy. So to make shopping a little bit easier for you this Christmas, we've compiled a few of our fave items from some popular shops so that you don't spend hours and hours searching. Whether it's a stocking filler, or something a bit more pricey, these items below are perfect if you're looking for a gift for your parents, friends or partner. Look out in the next few weeks for our online shopping gift guide. If shops just aren't for you, buying online is a win. What's best: we're keeping it proudly South African by compiling a bunch of local brand's products! 1 - Stag heads have been a hugely popular trend this year, but if you aren't into the real dead animal thing, this awesome white wash cardboard Sir Stag is just up your alley. Perfect as a decor accessory or gift, these come in a range of prints from Typo. 2 - What is a gift guide without at least one fragrance? Perfume will never go amiss as a Christmas gift, because what girl doesn't love to smell delicious! The new Bvlgari Omnia Crystalline is a woody and floral eau de parfum, with a velvety and textured fragrance. You can buy this and other fragrances from Edgars. 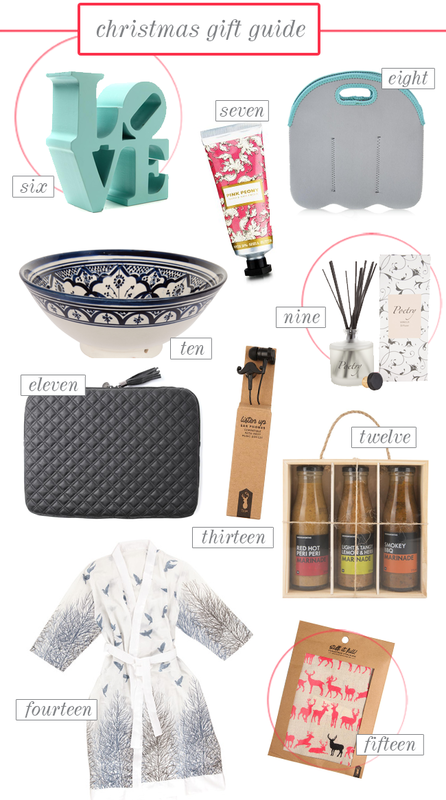 3 - Lovisa is one of our favourite stores for gift shopping, and they have something for everyone! We love these funky rings in mixed metals that can be stacked. How adorable is this moustache necklace, which is the perfect Christmas stocking filler. 4 - If you're looking for a classier gift, this Wine Selection is what you need. Woolies has put together a selection of five of their own branded wines, and at R229.95, it's affordable as a present for any wine-lover. 5 - Chocolate and Christmas go together like peas in a pod. So this Chocomania Body Butter from The Body Shop is a delightful little spoil, a creamy all-over body moisturiser with a chocolate-inspired fragrance. This goes for R140, and they have a whole set of other products in this range. 6 - For any book lover, this 'Love' bookend in Frankie blue from Typo is the sweetest gift and adds a great decor element to any desk or shelf set up. 7 - We love this perfect stocking filler from Woolies. Pink Peony Hand & Nail Cream retails at R49.95 and has the most gorgeous packaging! 8 - Unsure of what to buy your guy? Woolies has the solution! This Beer Carrier comes in grey or red, at R130. 9 - A person can never have too many diffusers! This Vanilla Diffuser is R320 from Poetry. We love that these are made locally and come in a range of other fragrances, including Rose, Moroccan Fig, Frangipani, Lemongrass, Amber, and Cotton Fresh. 10 - Perfect for any new home-owner or family member, this eclectic Moroccan Salad Bowl has hand painted detailing. It comes in red, green and blue and retails at R299 from Poetry. 11 - You can't get classier with this black, ribbed Laptop case in black from Typo. Stunning and useful present! 12 - Battling to decide what to buy for your dad who has everything? What about these Braai Marinades from Woolies? At R149.95 they are inexpensive and will give him lots of new cooking ideas for the braai. 13 - If you know someone who constantly has music blaring from their ears, then these Novelty Earphones are for them. They are fun, go-anywhere earphones that plug into any mp3 players. 14 - We love the beautiful print on this Bird Motif Cotton Robe. What a timeless gift at R399, and perfect for lazy Summer mornings. 15 - Last but not least, if you are looking for a Stocking to put your little gifts in, then this one from Typo is perfect for you. It's quirky and untraditional, and comes in a range of patterns. All pinks are credited in the links above.